My article on Jamaican poet Claude McKay’s critique of the racial politics of mainstream British socialism has just been published in the open access Lateral, journal of the Cultural Studies Association. “A Black Man Replies”: Claude McKay’s Challenge to the British Left highlights McKay’s time at Sylvia Pankhurst’s London newspaper, The Workers’ Dreadnought, in 1920. 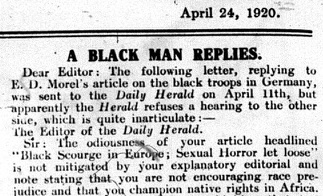 When the socialist newspaper The Daily Herald was feeding a moral panic over black soldiers’ presence in Germany, McKay wrote a letter to the editor to protest the depiction of black people as violent, sexual predators. When the Herald refused to publish McKay’s letter of protest, Pankhurst published it instead. Claude McKay, “A Black Man Replies,” Workers’ Dreadnought, 24 April 1920. The articles McKay wrote in the Workers’ Dreadnought resonate with his work from later in the decade. He wrote articles about the importance of nationalism for colonized peoples, anticipating his comments that led to the Black Nation Thesis at the Comintern Congress a few years later, and he wrote about sailors and docklands–a venue he’d return to most famously in his 1928 novel Banjo. The article aims to draw attention to McKay’s interventions as facilitated by Pankhurst’s pretty extraordinary anticolonial, antiracist publication, the Workers’ Dreadnought. I am so excited to be part of this issue of Lateral, joining authors Rayya El Zein, Jonathan Beller, Ed Chamberlain, Chris A Eng and Amy J. King, Kēhaulani Kauanui, Kyla Wazana Tompkins, Julie Avril Minich, and Jodi Melamed. It was a pleasure to work with the editors, Stefanie A Jones, Eero Laine, and Chris Alen Sula.